Every week we’ve been getting to know the stories of some of the most amazing entrepreneurs and business owners in our community. On this week’s Members Corner blog, we are pleased and honored to introduce you to an amazing talent in our community, Karla L. of Polymath Mom, LLC. 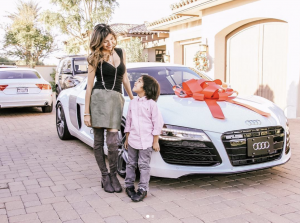 Karla is a mother of two, civil engineer, day trader, and the Founder of The Polymath Mom LLC, a nursery decor business, as well as an Instagram influencer with nearly 250,000 followers. We are proud to have her as part of the Avontage community. Please help us welcome Karla, visit her profile at The Polymath Mom, LLC, and send her greetings. Check out her Offer to see how she can help you promote your products and services. Mother of two, civil engineer, day trader, and entrepreneur. Wow! Karla is an influencer in the lifestyle, family, fashion and travel spaces. Her content focuses on highlighting the best of modern luxury and family time from well established and recognized brands to new or emerging ones. 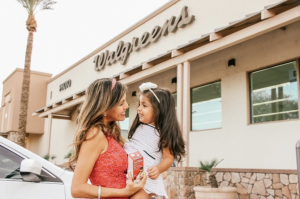 She has worked with a variety of brands – to name a few: Walgreens, Tylenol, Kidsbox, Plated, LaMer, L’Occitane, To Be Continued Consignment, Daniel Wellington, Riley Rose, Michael Todd Beauty, Lull, FlatTummyCO, HandMD, PerfektBeauty, Body Health Optimized, Cuties Citrus and more. Born in Lima, Peru. I came to Arizona in 2005 after getting married. We came to get our graduate studies at ASU and decided to set our roots here after purchasing a home. I love traveling, cooking, baking, fashion and spending quality family time and sharing my experiences with others. I love that we are only 4 hours away from Rocky Point and I go there very frequently to spend family quality time and unplug from work life. I started day trading as a hobby back in 2007 and now I manage my family and some friends funds. Arizona has the most beautiful sunsets I’ve seen. I love all the amenities it offers and the beautiful towns you can visit. The natural landscape is just fabulous. Love the feel of living in a city but without all the crazy traffic from Lima or New York. Soon, the business got a lot of visibility among other moms and I started to be reached out by so many brands not only specializing in kids and baby products but in lifestyle so I decided to make an Instagram account with a focus on lifestyle, fashion, family, finance and travel which are my passions. My content focuses on highlighting the best of modern luxury and family time from well established and recognized brands to new or emerging ones. I have worked with a variety of brands – to name a few: Walgreens, Tylenol, Hello Fresh, Everything But Water, Fragrance Net, Shari’s Berries, Classico, L’Occitane, Kidsbox, Plated, LaMer, Daniel Wellington, Lull, Ole Henriksen, Riley Rose, FlatTummyCO, HandMD, PerfektBeauty, Body Health Optimized, Cuties Citrus and more. Quality and thoughtfulness are the most important elements of a product to me when considering what to share with my audience, as I consider them to be the two defining features which set the finest products and experiences apart from the rest. I am highly sensitive to the artistic and creative direction of the brands that i work with. I love sharing my experiences, healthy living and family adventures and my posts are very authentic since I only work with brands I love. I’ve worked with such a variety of brands from the biggest one to new emerging ones that I don’t really have an ideal client. Anybody can really be a client whether is a service or product that want to show their product or service via my social media. My biggest problem is getting a client to tell me what they want. Some businesses have little social media exposure and don’t know where to start. As a small business owner, I’ve seen both sides so I understand the customer needs and what they are really looking for. If I see a company is not familiar with social media I usually help them with what I noticed is working online. How to target a certain audience, how to attract potential customer and how to approach them on social media. I just finalized a contract to go into the retail space with the largest company on baby nursery goods, Buy Buy Baby. I will be selling my products via their website starting next month so I will probably start getting more exposure on the baby/kids space and I am so excited about this new partnership. My biggest challenge is time. There are so many projects that I am working on but just not enough time. I’ve been reached out by different small businesses to help them with branding and advertisement but it’s just not enough time and everything revolves around my family. I’ve learned that as a mother and being a small business owner I can see the clients needs and be patient. 90% of my clients are moms or moms to be and I go above and beyond to ensure my moms are 100% satisfied with their products. I am putting a course to teach small owners how to grow their business and get exposure on social media and that should be coming probably at the end of the year. Consistency and that I truly care on anything that I touch. Both my parents were small business owners and my dad started to work since he was 8 years old, came from nothing and became very successful. My family is in Peru but the foundation and the values that they taught me remain in me and are being passed to my children. I’ve worked all my life. Even when I was a kid I remember going to my dad’s office and doing accounting at 12 years old and helping sometimes in my mom’s business from a very early age. When I came to the States it wasn’t easy. I left my comfy life in Peru where I never cleaned or cooked a day in my life and came to a whole new culture, language, etc and it was hard but I was able to little by little meet my goals. I am also a very honest person and since I work as a civil engineer I work with professionals, technicians and field staff and everyone is different so I’ve learned how to approach each crowd differently. I’ve been able to create a community with other mom influencers and we always share our experiences good and bad among each other. I am very family oriented so I love to follow people that can help me to grow financially and mentally. Tony Robbins, Jim Rohn, Jim Cramer, Kevin O’Leary, Joel Brown are my top 5. Be patient and kind and you will be able to achieve anything you propose in life and be kind with yourself. Sometimes you can be your worst enemy. If something doesn’t work in general there is always a solution. Oh gosh. That’s the toughest question. I guess I am just very good at juggling. I’ve learned to focus on one thing at a time and move to the next task rather than doing too many things at the same time and do things halfway. I always ask myself if my glass is half empty or half full? I am my answer is always half full. My family and extended family are so kind and supportive. My hubby is always pushing me and helping me grow. I am so blessed that he is always honest with me giving me his advise and that he helps me a lot with the kiddos. Thank you so much for reaching out and being part of the Avontage community and I hope I can help others grow their business. Please check out Karla’s Offer on Avontage and utilize her reach and influence to promote your business.